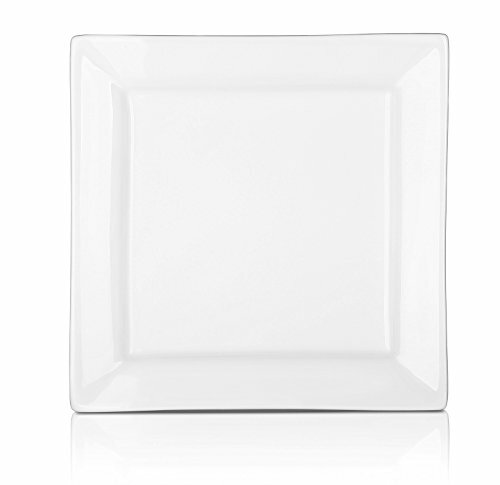 A square dish can show off more than your cooking skills! Easy pick-up raised edges, convenient for users to move the plate directly from counter to table. The not-too-deep or not-too-shallow concave space at center, perfect for holding soupy or juicy food, no need to worry about spilling. The perfect solution to tidying up an already cluttered kitchen! No matter how many pieces you buy, you can stack all up neatly without toppling risk, by so doing to save cupboard space. Your perfect gift option for friends, partners and family on housewarming day, birthday, wedding, anniversary and festivals. Easy to wash by hands or dishwasher. DOWAN is committed to providing customers a reliable shopping environment. Our 30-day break-and-chip warranty covers every piece of item we sell. You can easily reach us by directly replying our after-sales service letter (usually sent after you placed an order) if there emerges a product problem or if you're dissatisfied with the product. We promise we will take immediate and feasible actions to address the problem to your satisfaction. May the odds be ever in your life with DOWAN. Guaranteed Reliable Quality: FDA approved healthy porcelain (LEAD &CADMIUM FREE). Perfect for homemade pizza with meat, onions, and peppers, salad, beef and bean chili, Taco salad, hams, Burgers and sprouts. Unique Concave + Curved Rim Design: holding more juice while convenient to pick up and move directly from microwave to tabletop without spilling. Durable for Everyday Use: fired at high temperature to maximize the strength (resistant against scratch, breakage and chips), can be used for years over years on a daily basis. Microwave, oven, freezer and dishwasher safe. Strong Space Saving Feature: curved rims allow them all stack up neatly, no matter how many pieces you buy, you can stack them together to save cupboard space without toppling risk. 30 DAY MONEY BACK GUARANTEE- To show our confidence of our package for big size porcelain platters,we're committed to give you a refund or a free replacement if you received a damaged or defective item. Please feel free to contact us. If you have any questions about this product by DOWAN, contact us by completing and submitting the form below. If you are looking for a specif part number, please include it with your message.